The iPhone 6S video camera is so good, it will make just about anything like a groundbreaking art film. 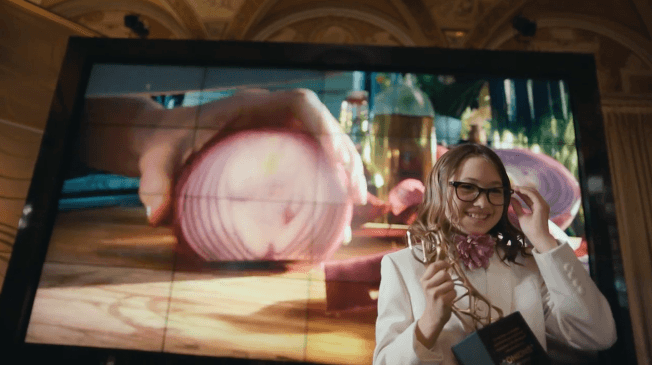 So says a new ad about a tween girl who leverages her high-definition smartphone camera into a career as an award-winning auteur … by filming a clip of her mother chopping a red onion. In the ad’s fantasy narrative, footage of the everyday cooking prep proves so beautiful, the entire world loses its mind over it. The video goes breathlessly viral, and agents scramble to sign the young filmmaker. Ultimately, she finds herself called up to the podium at an industry gala to accept a trophy from the host of everything, Neil Patrick Harris (of course). And the girl’s video does look pretty sharp—on par with top advertising food imagery like Wieden + Kennedy’s ads for British butter brand Lurpak. Apple has been batting a high average on that front of late, with its silly homage toKobe Bryant, Taylor Swift’s treadmill flop and Cookie Monster’s baking bit with Siri—not to mention the brilliant outtakes from the latter. The upbeat new spot also coincides with the company’s release of its less-than-encouraging quarterly results, so some observers believe it’s a deft bit of hand-waving to distract from the bad news. That may be true, but it’s hard to say for sure when dazzled by that genius video of an onion.